Super Mic Cable handcrafted with FLEXYGY™ 2T2 2-Conductor Microphone Cable and superior Neutrik XLR connectors with nickel shells and silver contact pins. 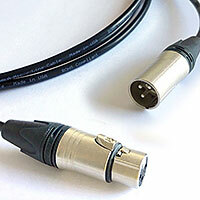 Standard diameter cable, but far from standard performance! FLEXYGYs exceptional high-density TC spiral shield and 41 strand copper conductors take care of noise AND make this cable totally flexible! The supple matte black jacket looks elegant and unobtrusive on ANY stage! Perfect for all microphone use and great for camera-mounted mics to camera mic inputs. Conductor DC Resistance: 14.3 ohms/1000 ft.
Shield DC Resistance: 11 ohms/1000 ft.